Samsung went big at CES with wall-sized displays and commercial LED cinema screens. Now, artificial intelligence software is taking a front seat to deliver image quality very near to native 8K resolution. Smarter upscaling capabilities could allow for compressed content to remain just as clear and crisp as native footage. Cable TV has yet to move beyond 1080p for the majority of the world. As 4K televisions quickly take over as the de facto standard, native content is still trailing behind. With the help of Samsung's Machine Learning Super Resolution (MLSR) technology, images can be scaled to appear as if they were 8K in real-time. Millions of still images and videos have been analyzed to train the artificial intelligence engine. There are three main criteria the software takes into account when upscaling content. First, localized adjustments of sharpness are applied to areas that would traditionally appear blurry after increasing the resolution. Second, edges are detected and properly modified to improve clarity. Finally, a noise reduction filter is applied to remove artifacts resulting from compression. Brightness and black levels are key factors that are also taken into consideration when converting content. Photos and videos that are not shot with HDR in mind can be enhanced to create the illusion of increased contrast. Sound is also taken into consideration when transforming lower quality content into lifelike images. Voices are able to be enhanced to make speaking roles more prominent over background noise. Directional changes to audio can be made to improve surround sound to more accurately reflect the content shown on screen. 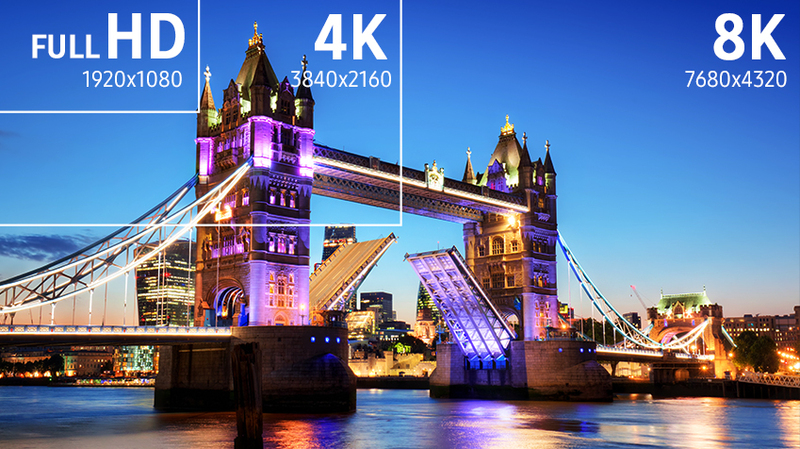 Without the need to deliver content in native resolution to achieve the maximum possible image quality, the relevance of 8K and higher resolutions may increase. Although there is no reason to rush out and buy Samsung's 85-inch 8K QLED TV that was shown off at CES, improved AI for upscaling could have uses beyond home entertainment. Top needs for improved clarity are in medical applications and virtual reality environments. There is no "good enough" resolution when human lives are affected by the ability of a doctor to clearly see small anomalies in images. In virtual reality headsets, displays mere inches from our eyes need to be extremely pixel-dense to prevent headaches and an overall poor user experience.